Discussion in 'iOS Apps' started by Mac-Addict, Jul 31, 2008. Set up your a network using Airport call it whatever you like, I called mine iPhone Tether. You can protect yours if you wish I was in a rush so I didn't. Open up system prefs go to network select Airport on the side. Don't worry what your IP looks like at the moment. You do not have to set up a location but it helps to keep everything in order, so to create one go to the drop down bar in network prefs and select edit locations and create a new one call it what you wish, you should be able to then switch from say Home location to the iPhone location and not have so many problems when tethering again. Then under TCP/IP select using DHCP with manual address then enter any IP for your mac, I used the one suggested by NetShare. Select Proxies and tick SOCKS Proxy. In the SOCKS proxy server enter a similar IP address as your mac's one this will be your iPhone's IP. Click ok and then click apply in system prefs. Under settings on your iPhone select Wi-Fi and connect to the network you just created, tap the little blue arrow next to the network name. Go to Static, under IP address enter the same IP address for your iPhone that you put in the SOCKS Proxy. -You will also notice that when your iPhone goes to sleep or you exit the netshare application it will quit and your mac will have no internet access via your iPhone. -AIM, MSN, Adium, skype ect will not work unless you specify the SOCKS proxy under the application's settings on your mac. - You have to create the network every time you disconnect from the network you created on your mac, Your iPhone should remember the network and connect unless its already connected to a different network. These browsers have their own proxy settings within their preferences. Enter the ip address against SOCKS Host. Save and Bob's your Uncle. I didn't get it in time. I don't understand this. How can Apple first agree to post the application in the store, then take it away after apparently realizing that it's against some ATT policy? How can it be that they're so disorganized? And how can it be that now some people are allowed to do the tethering (as they bought a legal copy of an Apple certified piece of software for $9.99), while others such as myself are not? I am so unhappy I missed the opportunity to download this application I have been waiting forever for... Nice tutorial! Hopefully Apple will get this cleared up and available again because it will be a big seller! Fingers Crossed! You act like unlimited really means unlimited When ATT tells you unlimited, what they are really saying is, "use it but not a whole lot, we gotta pay for that bandwidth." Lucky bastards who got it while it was there. But I am sure ATT will shut that down somehow. "The item you've requested is not currently available in the US store." Hopw do you make iTunes think you are from another country? Not anymore, as far as I can tell. That's what I don't understand (but probably should know). Is it piracy to trade a product that is not being sold anymore? I guess it is, otherwise the previous poster wouldn't have said that I'm advocating piracy. It will be up on the torrents soon enough but either way you will have to jailbreak it to get it to work. I was lucky enough to get NetShare and got it installed and working, however, I can't get Firefox and Thunderbird to use the systemwide socks proxy. Doesn't work with the Firefox/Thunderbird socks4/5 proxy setting either. Anyone else having issues with this? Works great with Safari, Adium, and iTMS. Get completely rofl'd by AT&T. you can't make yourself from another country. Only if you have another credit card from a country that itunes supports and have a billing address in that country. I've tried it to get albums overseas that were released before they were here in the US. Is it stealing if a minor takes alchohol or tobacco from a 7-11? Inability to steal doesn't follow inability to purchase. Copyright violations are copyright violations, regardless of whether the software is currently available for purchase. It's even illegal to pirate old Commodore 64 games without the copyright holder's permission. okay, everyone. Calm down. I am working on a temporary solution on ways to get the software on ur iPhone from the other stores. Whoever said you couldnt access the other stores, you are wrong, sorry. Once I have done it successfully, I will post the solution in a new thread. If anybody else has ideas or suggestions let me know. I got it and it works Friggin Great. Thank you to the Apple employee that let this one slip by!!! I guess I don't see appeal of this as opposed to jailbreaking and then doing it manually... For free. It's not going to work, in order for the app to work you would need his itunes username and password otherwise it won't install. it's like giving you a blank cheque! 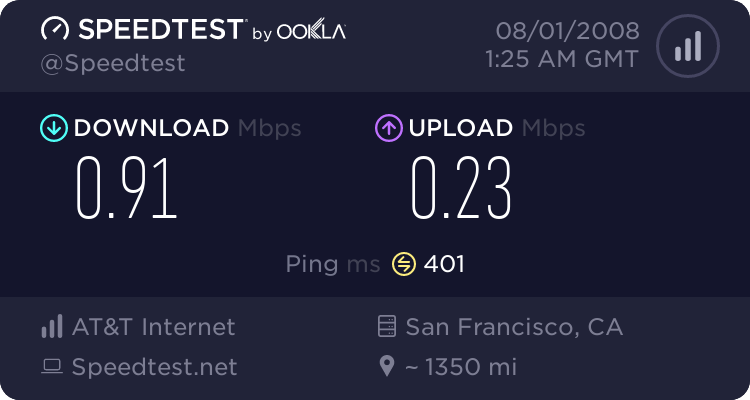 for those who got it, can you post a screen shot of the speedtest? A different question: are there ways to share the application install file, e.g. by posting it somewhere for others to download? So... the answer is... technically, the file could be shared, sure. But unless/until the DRM for these apps is cracked, it doesn't make much sense, as they wouldn't work. I downloaded and then my computer crash....do you mind sending me a copy of your version? As I said above, this wouldn't work. You'd need your own, Fairplay-authorized file. I learned something interesting today, with regards to how Apple handles re-downloads, too. So far they've been very agreeable, allowing you to re-download at no charge any app you've paid for. One wonders, then, what happens when an app is pulled from U.S. distribution... like this one? Well, after I snagged this NetShare app, I passed the tip along to a friend. He bought it too (before it was pulled, 15 minutes later.) Then he had to do a restore of his iPhone (for an entirely unrelated reason.) He realized he had no backup of this NetShare app... and then later learned it was no longer for sale "in the U.S."
Well, when he tried to re-download, the request went through and he was able to download it. Just as he would any other app. Even though others were getting that error message. So it seems like Apple protected the customer's interest here, and grandfathered in those who managed to purchase it in time. I found that rather surprising, reassuring, and nice. Because they just as easily could have said "tough noogies," I suppose. Which also means, if user "G0D" had paid for it "then his computer crash" he would have been able to download it again at the time he posted his request. That is, if he wasn't lying. Now that the app's not even listed in the store, though... I suspect he wouldn't have been as lucky. I also wonder how they'd handle a free app that got pulled... would previous downloaders be able to download it again? It's got something to do with setting up and verifying a bank account in that other country. FWIW, I know someone who logged into the UK iTunes Store and wasn't able to download NetShare from there either... it was pulled from there, too.